How was/is everyone’s summer going…? It’s been absolutely beautiful weather here in Alberta the last little while… almost too hot at times! But luckily most of us (like me) get to enjoy the luxury of the Air Conditioner in the combine. I was a little sad when the 30 day photo challenge was over.. it was a lot of fun & I enjoyed seeing everyone’s photos. Plus I was excited that I totally rocked the goal!! With this, I decided to start a new 30 day challenge. Its “BE ACTIVE” for 30 days. It is a bit of a tough time right now to make time to workout if you are a farming gal… but I feel it can still be done! Anything counts… instead of waiting in the field for your ride, start walking, or do jumping jacks… or climb up & down the combine. It doesn’t have to be anything big… just something active. Ride your horse, Ride your bike, Walk to the shop, anything is better then nothing! 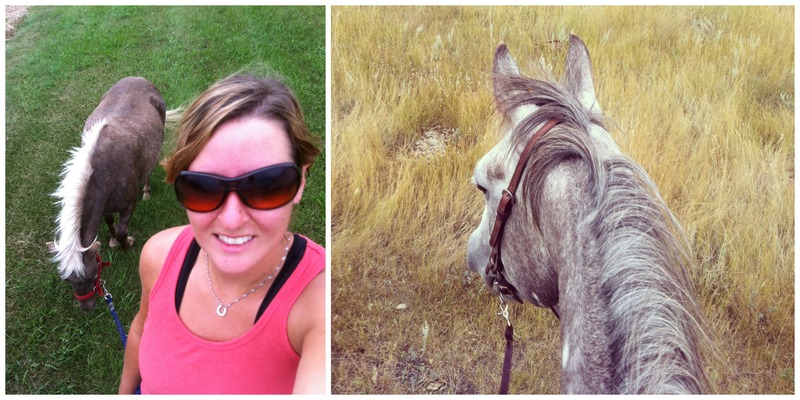 Day 2 – Went for a ride.. then took my pony for a walk/jog around the farm yard. I was looking on Pinterest… (of course… who doesn’t) for some fitness inspiration… & I found a 30 Day Squat Challenge! I was in a good routine of doing squats, to help build up my bad knee, but the last little while I got away from doing them… with this being said.. I am going to start the 30 Day Squat Challenge today.. & work it into my “Be Active!”. “Squat challenges are all the rage now, and while it certainly is an accomplishment to work your way up to 200, 500, or even 1,000 squats (yikes! ), doing the same kind only works certain muscles. Here’s a new challenge for you to try. It involves five different squat variations that you repeat and eventually work up to 200 reps in 30 days. Here are instructions for the five different variations followed by a 30-day plan to get you all the way to 200. It’s not advised to skip right to day 30 if you want to be able to walk the next day, so follow the plan and adjust it slightly according to your schedule and ability level. Keep reading to see the other three squat variations and the 30-Day Squat Challenge Plan. Here’s a video demonstrating the basic squat. Please Join me… in Either or Both Challenges.. but get outside! Its beautiful & before we know it winter will be upon us.. so enjoy this Indian Summer while you can. Have a wonderful Week… & I hope you are all able to be in the field working hard~! ← 30 Day Photo Challenge Complete! !